Sliding down a frog’s tongue isn’t a to-do today. Time to relocate to the back porch to concentrate until the autumn afternoon sun makes it hard to see the laptop screen. fighting fret over other concerns, and fighting the flu-like crud that’s going around, which has left me with the deepest voice I’ve ever had – friends have doubts that it’s me on the phone! Meanwhile this frog mocks me. Back at ya, frog! At least I’m trying; actively trying. Grasping at straws, swimming against the tide, slowing the trending fail rate, amputating with regrets while severing things unproductive. Anyone can stick out their tongue. 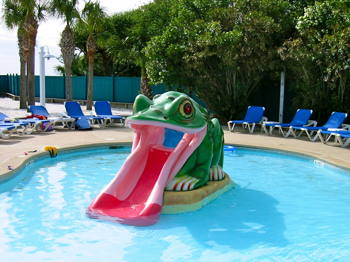 That frog didn’t place itself in the middle of a resort pool. I am so out of here. Still have that trump card as a resource – I have freedom and mobility, plus the knowledge that I don’t have to put up with any crap like an animated pool frog sticking its tongue out at me. Plus, just realized my passport has expired! Ugh, I’m so over-clocked that I’ve gotten myself landlocked. Back to the back porch. This ship won’t be righted for months so I’m duffle bagged for the duration. I think it’s going to be a long long time. I miss so much. Good thing I’m blessed with a blissful lack of dependance on any reality but my own.